Why do we market our products? Well, for customers to know about us and our product. Through advertisements on different marketing channels. Do these advertisements give you ROI? Here’s the catch! The answer is ‘Not Really’ for many businesses and it depends on your content and marketing strategy. The market is saturated with brands using only content marketing and there is a dire need to innovate and make your brand stand out! Visual Content Marketing is the answer. It has become a mandatory digital marketing tactic due to its strength over text-only and non-visual content. The right videos, infographics, images, presentations, quote cards can tell your brand story, drive your audience attention and increase traffic to your product or service. These methods make your content shareable on various social media platforms like Facebook, Twitter, Pinterest, Instagram or LinkedIn. Posting random visual content on social media platforms won’t serve the purpose but a well planned digital marketing strategy in line with the ethos and values of your brand can build a long term relationship with your targeted audience. Volkswagen visual content is inspiring and a treat to eyes. The Facebook timeline is a visual representation of the journey of the brand and stories of the past. The fans and customers get a glimpse into the word of the German automotive company and its masterpieces. The brand name ‘Volkswagen’ when translated means ‘people’s car’ and the company’s timeline is truly for the people to enjoy the cultural lessons shared on it. Every post is educational and has an interesting story to tell you. Whether you want to know the brand history, a new car, customer reviews or fun facts, the Facebook timeline has it all. Apart from Facebook, Instagram and Pinterest are equally a visual treat. Watch the below video to understand how the Brand Director of Volkswagen adds a personal touch by explaining the product and its features in the advertisement of the 21st Century Beetle. The 21st Century Beetle is finally here! Use the tactic and turn your social media platforms into a visual representation of your company’s history. Keep it real by sharing the brand’s story with images and build an emotional connection with your consumers. Use behind-the-scenes images, milestones, and team pictures. Taco Bell’s posts on the Instagram page looks colorful and artistic, unlike other food joints page. Presenting the delicious food items in various colors and modern art pieces is very innovative and fresh. It tempts you to grab one of them or rush to the nearest joint. So impactful is their visual content! Show your product in the simplest yet appealing way explaining your product and reasons to buy them. Create new and different pieces of visual media, for anyone to find it intriguing. Experiment but do not go overboard losing the basic values of the brand. Grammarly is an online proofreading and correction tool famously know for its quote cards which is a combination of humor and knowledge. The visual content is so powerful, simple and to the point that you cannot give a miss. Their Instagram and Facebook page says it all. Over the years, I have enjoyed watching their visual content which is interactive and engaging. The visual content marketing is amazing that makes the boring topic ‘Grammar’ – no offense- very interesting. Grammarly cards are easy to share images across all social media platforms. A classic meme with humor and knowledge. A great example of interactive visual content marketing. Simple and well-designed cards can be equally impactful and flashy designs are not always required. Clever and creative presentation win over high design – a formula for anyone to follow. Coca-cola is a trendsetter in visual content marketing over the years. The visuals on their Tumblr page are interactive, refreshing, colorful and quirky with well designed animated GIFs, images and brand memorabilia which is incredibly easy to share. Every post on their social media platforms is interwoven in a story with hashtags like ‘SayitwithCoke’, ‘Tastethefeeling’ or ‘Shareacoke’ and more. Their new content strategy has moved from ‘One-way storytelling’ to ‘Dynamic way of storytelling which means that the story should evolve over interactions and conversation with your customers over various social media platforms. Another initiative taken by the company is to collect and recycle the equivalent of its packaging by 2020. A worthy step towards social responsibility. I distinctly remember the famous ‘Share a coke’ campaign where the brand used personalization. It had put 150 common names on the bottle and encouraged the customers to share it with people having the names. It was a big hit and was rolled out in many countries and later you could also customize the bottle. Such an amazing idea, isn’t it? Create and share interactive content to make it engaging. Your visual content helps in your brand recognition, so include every aspect of it from color to design. Personalization means involving your customer and making them a part of your brand. Storytelling is a great way to influence and build a connection with your audience. Social responsibility initiatives must be a part of companies goals and culture. AMC theatres transports you in the world of movies, from old classics to the latest releases. The followers are treated with movie updates, fun facts, giveaways, videos, and collectibles shown through their pins. The pins don’t promote AMC directly but its work, which is evident and in line with the brand. Their aim is to provide entertainment and film expertise to all the film lovers. AMC doesn’t promote its upcoming movies like the competitors but maintains quality content as a priority and provide an enriching experience via its pins and posts. Be an expert in your field or industry and become a reliable and go-to resource for your audience. It is not necessary to always promote your business but your product or service which is in line with your brand. Do not overdo any promotions. Create different Pinterest boards for your product like in the case of AMC(Classics – Giveaways- Award Shows -Bond movies -Videos – Movie Quotes). Similarly, you can include Images, Answer your customers, Tutorials, Videos, Customer reviews, and several other relevant boards. Aeropostale follows a simple but effective visual content marketing strategy. The fashion and lifestyle brand posts lucid, simple and beautiful images of its modern and contemporary ensemble of clothes and accessories. Through the posts, Aeropostale advertises its own clothes and how one can carry with panache and style. It gives its audience different ideas on clothing styles and fashion sense to create a distinct look. Simple can be effective and is not necessary to always use snazzy visual content tools. High-quality images are incredibly important. Show your brand’s uniqueness and comfort through the images. Use personalized hashtags for your brand so it is easy for your followers to follow it and include in their own posts. Whole Foods Market is one of the leading company in content marketing who knows how to engage the audience with their informative and excellent storytelling ways of the visual content. The Facebook page photos of the product and graphics provide helpful advice to their audience. Storytelling in visual content is the most engaging and emotional way to connect with your followers. Providing informative visuals helps to build trust with the audience. Most companies fail at their interpretation due to a lack of defined strategy for their brand. 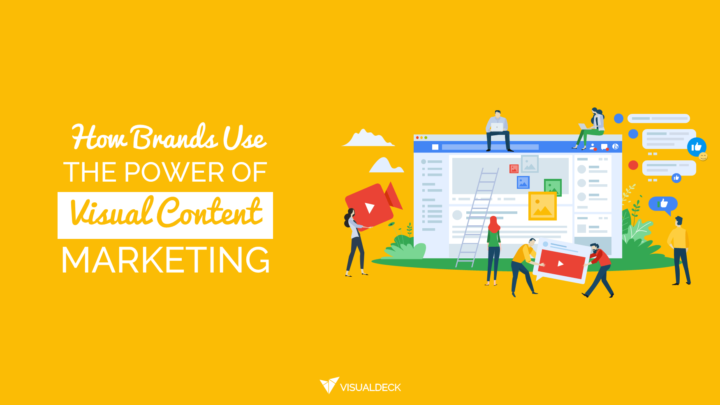 It is not about only creating content and putting it up on various social media platforms but to know the various aspects of visual content marketing and create recognition and differentiation for your brand. Share your visual content when maximum followers are online. There is no one-size-fits-all approach and therefore you need to build a visual marketing strategy that earns you traffic, shares, engagement and brand recall. Need help in creating visual content? Visual Deck offers unlimited visual content at a flat monthly rate. Try us out with a 14-day risk-free trial!